Directorate General of Immigration & Passports (DGIP) and launched the Machine Readable Passport (MRP) Home Delivery Project in collaboration with the Government of Pakistan back in 2015. The project was inaugurated by Ch. Nisar Ali Khan, Minister of Interior at the Nadra Headquarters in Islamabad on Nov 10, 2015. 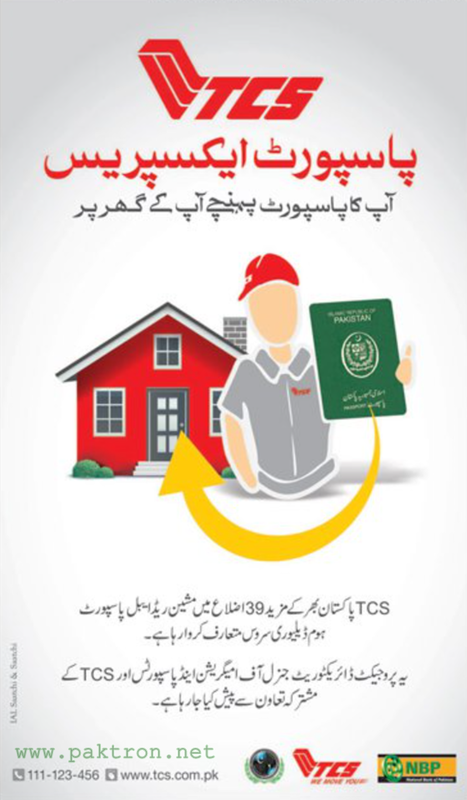 The aim of this project is that the citizens of Pakistan will have the more convenient and cost-effective option of having their Machine Readable Passports delivered to them right at their doorsteps through TCS Passport Express. This is a Public Sector Development Program of the Government of Pakistan which has been mandated to convert manual passports and visas into Machine Readable Passports and visas, and then print the passports and visas before delivering them to the applicants within a specified time. The new ‘Passport Home Delivery service will offer a swift, reliable, and secure option to the applicants and will deliver their passports at their given home addresses. This services was initially be offered in 7 districts of Pakistan including Karachi, Lahore, Islamabad, Rawalpindi, Peshawar, Quetta, and Muzaffarabad. Now TCS extends this service to 39 more districts of Pakistan. This is in the responsibility of TCS that the Machine Readable Passports dispatched by the MRP Office reach the correct person or his authorized representative on the given address within the prescribed time limit and in a safe and secure manner. How to get Pakistani Passport ?